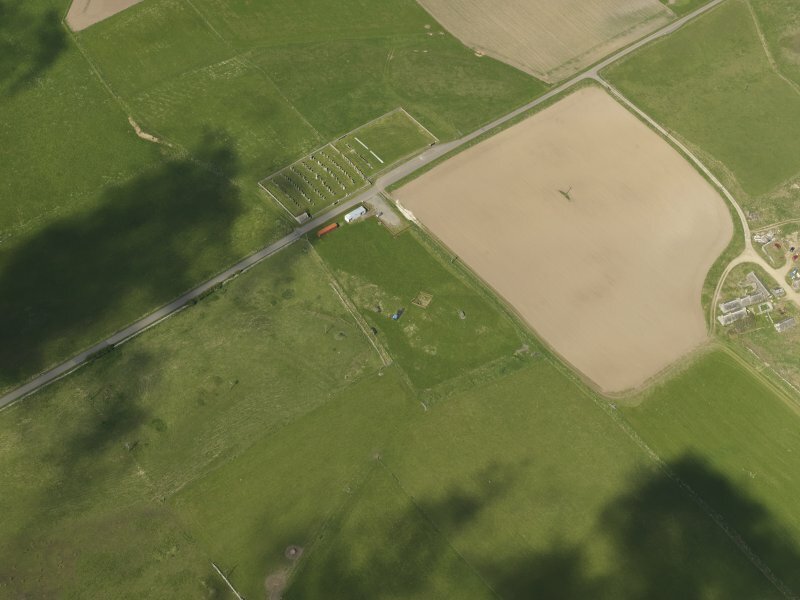 Oblique aerial view centred on Mine Howe, taken from the SSE. View up upper flight of ladder steps. View up into corbelled roof of lower chamber. View up lower flight of steps from cistern to half-landing, after installation of handrail. View down lower flight of steps to cistern, after installation of handrail. Oblique aerial view centred on Mine Howe with St Ninian's Chapel adjacent, taken from the SW.
Oblique aerial view centred on Mine Howe with St Ninian's Chapel adjacent, taken from the NNW. Section through the subterranean chamber. This is one of many glacial-looking hillocks lying E of the cemetery and 400m SE of the parish hall at Toab. A good few years before 1979 a school-teacher moved some stone on the summit and found an opening with steps leading down. The proprietor caused the opening to be re-sealed. RCAHMS 1987, visited April 1979. An underground chamber relating to the mound was rediscovered in 1999. An excavation was undertaken and the mound, though natural, contained a chamber and was surrounded by a ditch. For a full account, see MS/1040/3. This subterranean structure has been sunk into a natural mound in an area of undulating ground about 100m SE of the cemetery on Churchyard Road, Tankerness. The mound itself, which is indistinguishable from other natural mounds in the vicinity, is about 3m in height, and it formerly lay at the centre of an oval ditched enclosure measuring some 41m from N to S by 37m transversely internally, with a broad entrance facing towards the W (Card et al. 2000 (NMRS MS 1040/3), GSB 1999 (NMRS MS 2000/1)). No trace of the ditch is now visible, but the mound occupies the whole of the interior, and the ground rises gradually from roughly the line of its inner lip to the summit where a modern pit has been sunk and now provides access to the mouth of the structure below. 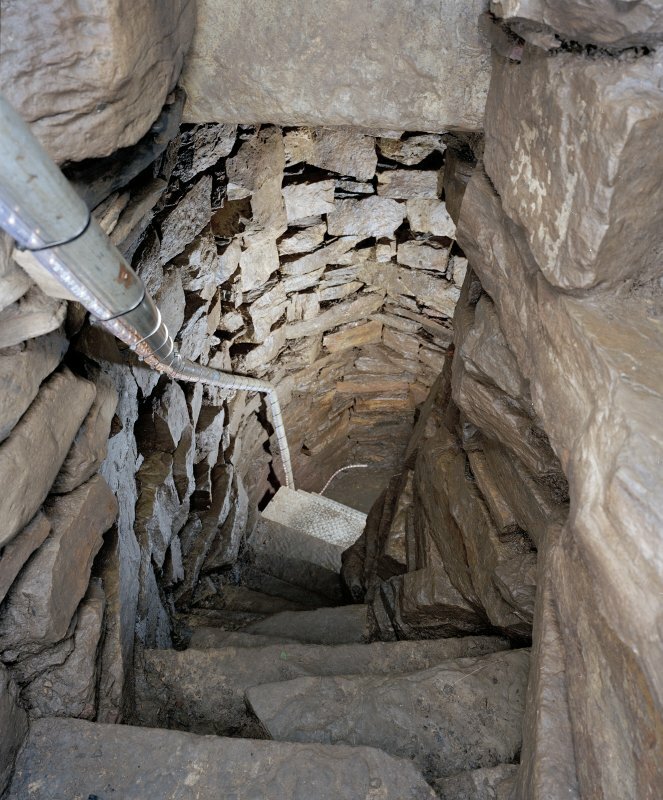 Built of drystone masonry, the latter lies beneath the centre of the mound and comprises two flights of stone steps, the upper of which leads down to a half-landing and the entrances to two subsidiary galleries, and the lower on down to a corbelled chamber at the bottom. 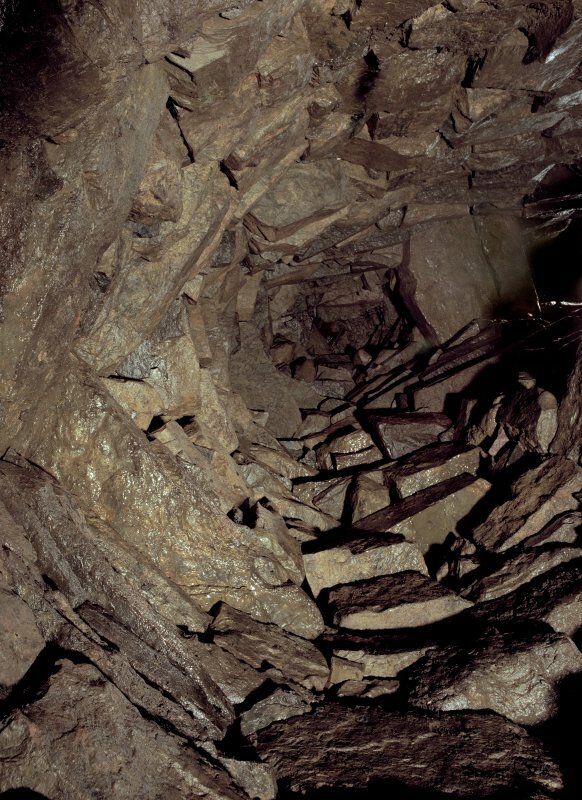 The structure appears to have been constructed in a pit about 4.4m in diameter, and the floor of the corbelled chamber at the bottom lies 7.4m below the top of the mound. 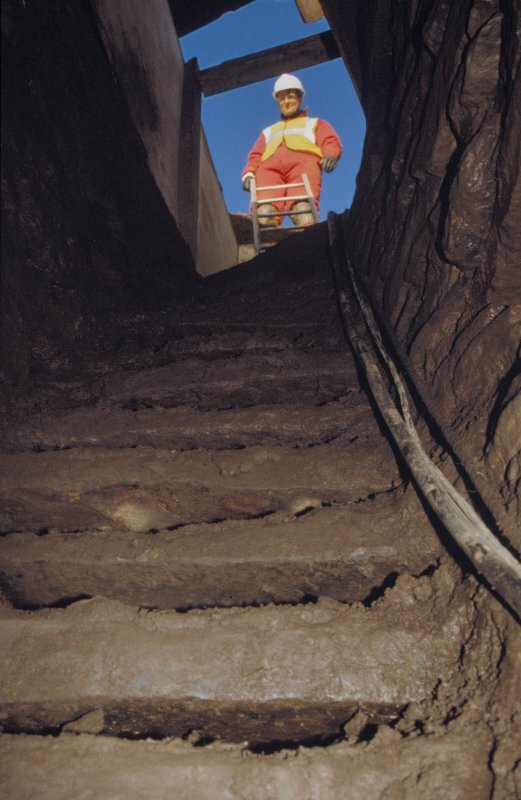 The pit in the summit, which now contains metal stairs, has been dug down 1.85m, revealing that the material above the structure is composed of unconsolidated earth and stone, perhaps largely derived from midden. 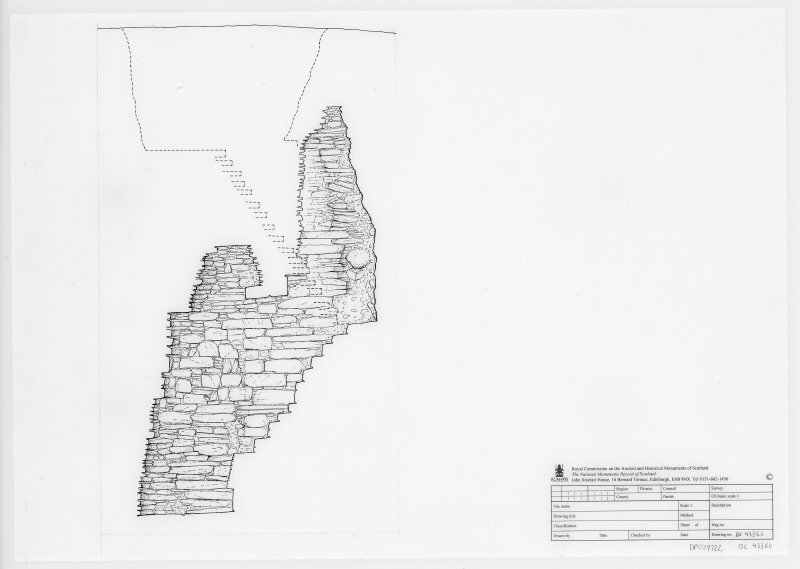 The upper flight, comprising seventeen ladder-like steps, drops down from N to S between coursed drystone walls for a further 2.75m to the half-landing on to which the two subsidiary galleries open. The S wall of the half-landing is formed by natural till, and presumably forms the S side of the pit in which the structure is built. The entrance to the lower gallery is about 0.6m square and its sill is 0.43m above the half-landing; the gallery itself is no more than 0.4m in width at one point and it extends back in a shallow arc for about 2.4m. The upper gallery, the sill of its entrance 1.42m above the half-landing, runs back above the roof of the lower flight of steps and the corbelled chamber; some 2.8m in length, it is much wider and higher than the lower gallery, measuring up to 0.9m in width and 1.25m in height at its inner end. Midden deposits are visible on the N side where the masonry at the inner end has collapsed. The capstones of the roof above the ladder steps is about 2.7m above the half-landing, but two other lintels span the void, acting as tie-beams between the walls flanking the steps. This structural technique relieves the dead-weight of the masonry above the structure, and, whatever other functions the galleries may have fulfilled, they too serve this purpose. From the half-landing the stair turns back on itself, descending a further 1.9m in a flight of eleven steps to a sill 0.9m above the floor of the corbelled chamber. The latter is about 1.3m in diameter and the capstones of its roof are 4.1m above the floor. 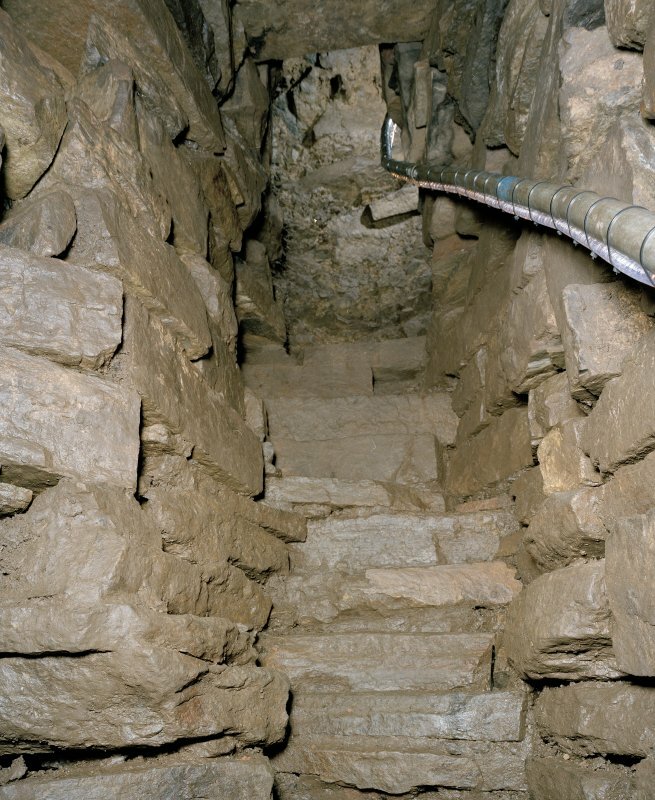 The drop down from the lowest step gives the chamber a cistern-like appearance, and the fissures between two massive sandstone slabs forming the floor, which are probably bedrock, are filled with clay. The chamber does not hold water at present, but the present water table may be below the level of its floor. It is noteworthy that the top flight of steps is oriented to face N, minimising the ingress of light into the structure. The drystone wall construction, the ladder-like steps and the various techniques for relieving the dead-weight of the structure, suggest an Iron Age date, and this is supported by evidence from the recent excavations (Card et al. 2000). The 'well' inside the Broch of Gurness (HY32NE 5; Fojut 2001) provides a good analogy and other parallels are listed by Hedges (1987). HY 5105 0603 In the late summer of 1999, local farmer Douglas Paterson rediscovered an underground structure which had originally been found in 1946. Since its initial discovery the site had almost been forgotten apart from a brief mention in the SMR. The chamber comprises a series of steps that descend to an intermediary landing that has two side chambers off to one side. A further flight of steps lead down to a chamber c 1.5m in diameter with a corbelled stone roof rising to c 4m above the flagged stone floor. The floor of this chamber is c 7m below the top of the glacial moraine into which it was built. Most of the structure is lined with drystone masonry. 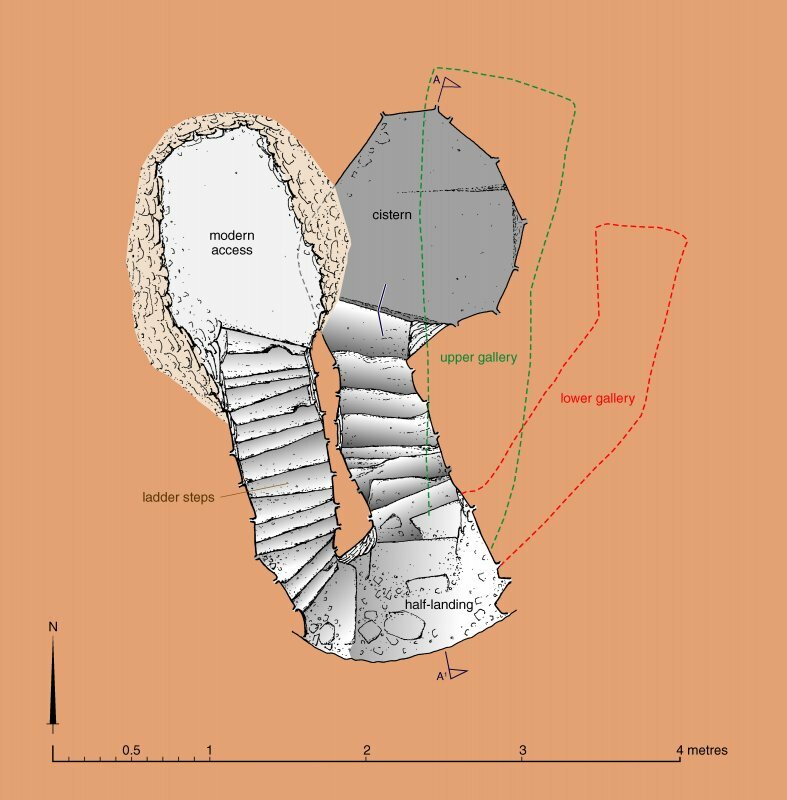 The Royal Commission surveyed the site in November 1999, resulting in a plan, a section through the chamber, and a contour survey (see this volume, p 106). GSB Prospection was commissioned to do a geophysical survey, utilising magnetometry, resistivity and ground-probing radar (GPR). 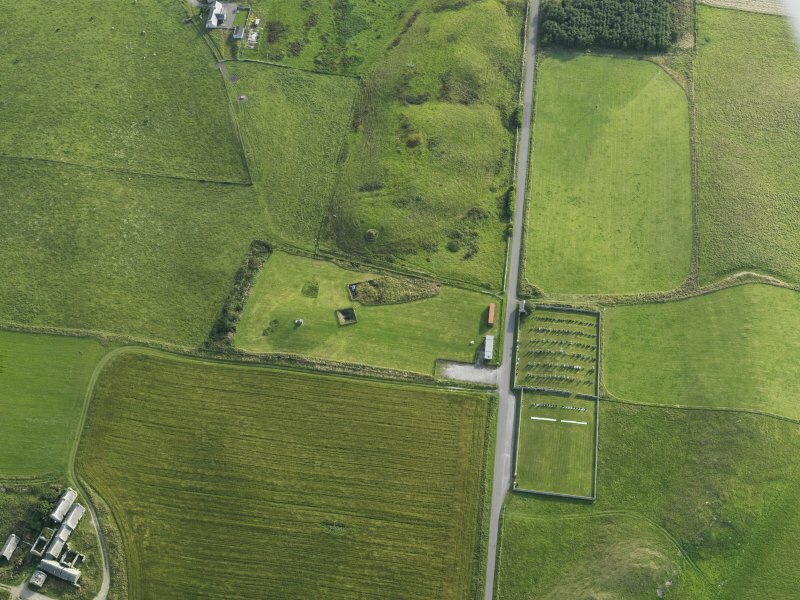 The results of this showed that a large ditch, c 7m wide, 50m in diameter, and with a clear break/entrance on the NW side, surrounded the mound. Concentric to this ditch was a series of what appeared to be subsidiary gullies and ditches at intermittent points around the mound. Evidence for settlement-type activity occurred both in and around the entrance across the main ditch. GPR indicated the possibility of other chambers existing within the mound. Due to a series of agricultural threats, the uniqueness of the structure, and the need for a better understanding of the site prior to Scheduling, excavation was started in the early summer of 2000. The main aims of the project were to evaluate the nature and date of the features revealed by geophysics and to look at the relationships between these various elements and the underground chamber. Four main trenches were opened. Trench A was located across the main ditch opposite the entrance to look at the relationship of this ditch to two of the subsidiary outer gullies/ditches. Excavation revealed that the ditch here was c 5m wide by 2.5m deep with a sharp U-shaped profile. The ditch had been deliberately infilled with a series of midden and rubble fills that probably represent several different phases. Finds from these fills include Roman glass, a fibula brooch and Middle to Late Iron Age pottery. Within, and probably contemporary with the ditch was a paved area, c 2m wide, which may have extended around the mound. This paving was set on a platform cut into the mound and had a revetting wall along the back of it against the mound. Once the ditch had been infilled the paving was extended to partially cover the ditch. In an extension to this trench, to the SW, the paving and revetting had been extended to form a semi-circular platform/'alcove' cut into the mound. The gullies suggested by geophysics outside the main ditch proved to be illusory. These features were created by a series of anthropogenic soils built up against the sides of the mound. A 1m wide slit trench was extended from the NW end of this trench up to the opening of the underground chamber, to examine the relationship of the ditch to the chamber and to determine the presence of any structure on top of the mound. Glacial boulder clay was encountered directly under the topsoil. This may have been partially redeposited to enhance the height of the mound, but concerns over destabilising the underground structure prevented further investigation. Trench B was located over one of the main ditch terminals. This revealed a ditch up to 7m wide and 4m deep with a flat-bottomed U-shaped profile. The earlier phases of the ditch were associated with at least three different phases of revetting of the terminal. The later phases of revetting included a widening of the entrance causeway and a partial infilling of the ditch with rubble. The upper ditch fills contained much more midden material. This contained a large element of metalworking debris which probably originated from some ephemeral structures at the NW end of this trench and those uncovered in Trench E. Latterly these midden deposits were partially paved over before the ditch was totally infilled. As in Trench A, a 1m wide slit trench was extended from the SE end of the trench over the mound towards the present entrance to the underground chamber. This revealed a shallow linear feature and the edge of a small cist-like structure. This trench was further extended to totally uncover the cist, which was filled with a dark, charcoal-rich fill and a small amount of cremated bone. Trench C was located over two anomalies revealed by geophysics; an apparent circular enclosure cut by or cutting one of the subsidiary gullies/ditches. On excavation neither feature was detected. Instead, 1m of anthropogenic midden-rich soils overlay a series of gleyed clay deposits over 1m thick. The interpretation of these deposits awaits the analysis of soil samples. Trench E was located over the apparent settlement area outside of the causeway across the main ditch. Under a series of rubble and midden spreads a lobate Late Iron Age structure was uncovered in association with some very ephemeral features. This structure overlay an earlier, larger structure, probably a roundhouse. These structures were separated from midden-enriched soils to the N by the remains of a field boundary stone dyke. Middens associated with these structures produced a large range of industrial waste including moulds, slag, furnace linings and evidence for bone and antler working. In the SE corner of the trench a section of bank was revealed composed of redeposited natural. This may be an external bank to the main ditch that surrounds the mound. Trench F was dug by machine in an area identified as being clear of archaeology and was intended for the disposal of the waste from the chemical toilet. However, at a depth of c 1.3m beneath a series of anthropogenic soils, a deposit of cremated bone and charcoal was revealed. It is at present not clear whether the bone is human or if the horizon in which it was found is a soil or deposit. Under this were clay deposits similar to those at the bottom of Trench C.
Although the underground structure had been extensively emptied in 1946, in situ deposits were identified in the middle chamber. This ashy midden was sampled and was also found to contain both native Iron Age pottery and a sherd of coarse Roman ware. Sponsors: Historic Scotland, Orkney Islands Council, Orkney Enterprise, Orkney College, Time Team, Orkney Archaeological Trust. HY 510 060 The Late Iron Age metalworking area outwith the ditch that surrounds the underground structure at Mine Howe (HY50NW 38; DES 2001, 71) was further investigated in 2002. Further evidence recovered includes crucibles, slag, tuyeres, furnace linings and a kiln. This appeared to be associated with an oval stone structure c 6m in diameter. A whale-tooth sword pommel was recovered in one of the alcoves built into the wall of this structure. Time did not allow the floor deposits of this structure to be investigated. Several sherds of Romano-British colour-coated ware were also recovered. Archive to be deposited in Orkney SMR and the NMRS. HY 510 060 The Late Iron Age metalworking area (Trench E), outwith the ditch that surrounds the underground structure, was further investigated in 2003 (HY50NW 38; see DES 2002, 87-8). Excavation concentrated on the round structure uncovered at the end of the 2002 season. Four main phases of activity within this structure have so far been identified. Throughout its history it appears to have been primarily a workshop for the production of non-ferrous metalwork. Besides a wide assemblage of associated debris being recovered (including moulds, crucibles, a steatite ingot mould, a copper ingot, anvils and whetstones), several small kilns were found in the interior. This workshop may only represent the last phase in a long history of metalworking at Mine Howe. A deep sondage was excavated to the N of the workshop to further explore the plaggen soils around the site. This revealed that over 2m of archaeological material had been deliberately deposited during the Iron Age. Near the base of this sondage, ironworking debris was still encountered. The sondage also showed that the landscape around Mine Howe had been dramatically altered during the life of the underground structure. A new trench (Trench G) was located over the main ditch to the W of the underground chamber. Unlike Trenches A and B opened in 2000 (DES 2000, 65-6), this trench was intended to investigate a 'quiet' area of the ditch as suggested by the magnetometry survey. Excavation, however, showed that the lack of magnetic responses in this area was due to the depth of overburden masking underlying features. An extensive spread of animal bone was encountered in the upper fills - corresponding to a similar bone spread in the ditch terminal excavated in 2000. Below this were thick deposits of ashy middens - again similar episodes of deposition were encountered in previously excavated ditch sections. Beneath the middens, part of an oval stone-built structure, c 3.5m in diameter, was uncovered. The single-faced walling of this structure consisted partly of upright slabs with drystone masonry on top and was built into the partially infilled ditch. The floor was partially flagged with rough paving, slumping into the underlying ditch fills. A possible drain underlay the paving. No finds were associated with this structure. 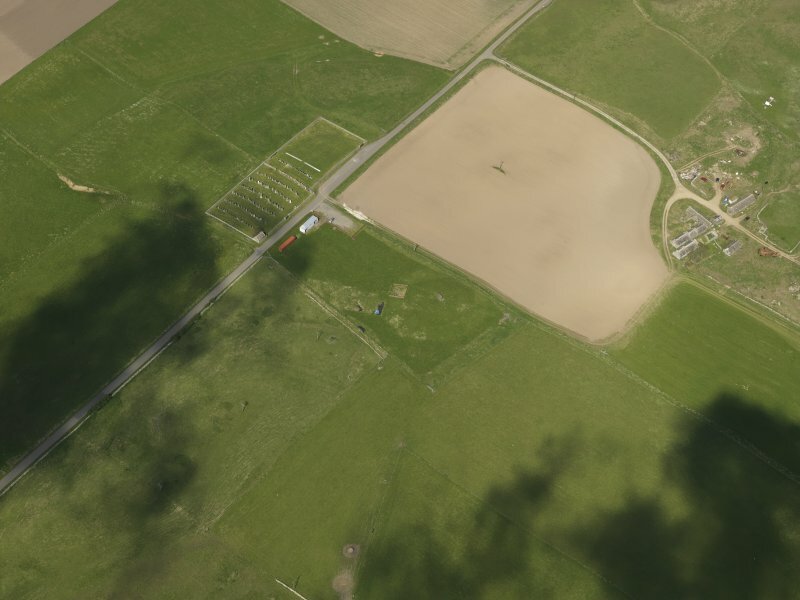 After the ditch had become totally infilled and was probably no longer visible, a sub-circular pit, c 1.5m in diameter by 0.5m deep, was dug into the outer edge of the ditch. This was lined by a series of large upright slabs. In the uppermost fill, central to the pit, was the inhumation of a child. Apart from a spread of charcoal lower down, the rest of this feature was devoid of finds. A narrow slot trench was extended from the NE corner of Trench G towards the top of the mound, in order to investigate a small, discrete, highly magnetic anomaly. This was only one of numerous similar anomalies that appeared in the original magnetometry survey. This anomaly proved to be a largely intact iron furnace. It had been built in a shallow pit with four upright, carefully wedged slabs forming the main structure, c 0.45m square. The fired clay superstructure had collapsed into the interior which was filled with slag. Two small upright stones on one side probably formed a flue or access point for a tuyère. This furnace was left unexcavated and covered over. It is hoped that a metallurgist specialist will be involved in the dismantling of this next year. A single course of revetment was revealed in this trench on the inner edge of the main ditch - similar to that found in Trench A in 2000. Report to be lodged with Orkney SMR and the NMRS. Sponsors: HS, Orkney Islands Council, Orkney Enterprise, Orkney Archaeology Trust, Orkney College. HY 510 060 Excavations in 2004 were aimed at elucidating the nature and range of activities that took place subsequent to the construction of the underground chamber and its surrounding ditch (see DES 2003, 101-2). The Iron Age metalworking area (Trench E), which lies outwith the ditch that surrounds the underground structure, was further investigated. Excavation concentrated on the smithy uncovered at the end of the 2002 season (DES 2002, 87-8), with preliminary investigation of the floor levels in 2003. Evidence for both ferrous and non-ferrous metalwork was found. In the primary phase of use, a large central hearth was surrounded by evidence for various associated activities including small smithing furnaces, anvils, etc. A very rich assemblage of associated metalworking debris was also recovered. Archaeomagnetic dating of the central hearth provided a date of 100 BC to AD 110. At the end of the primary phase of use, a formalised extended inhumation burial of a young woman was placed under the floor of the smithy. She was buried with a toe ring on each foot and an antler object on her chest. 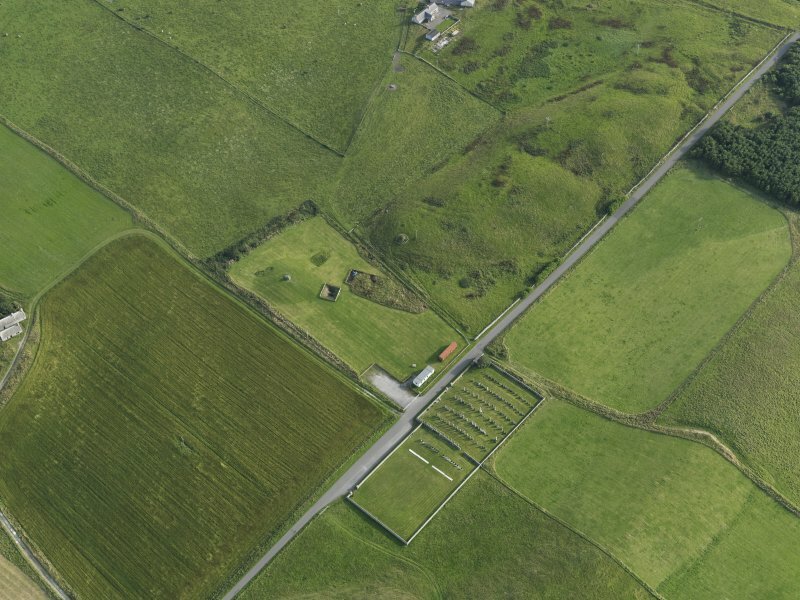 In 2003, a deep sondage excavated to the N of the smithy revealed that over 2m of archaeological material had been deliberately deposited during the Iron Age and that the landscape around Mine Howe had been dramatically altered during the Iron Age. This sondage was extended in 2004. This revealed that outwith the inner ditch surrounding the mound containing the underground chamber there had been an outer gully, probably natural, c 40m wide and up to 2m deep. Although present at the front of the monument, the extent of this feature is not clear. The structure revealed within the ditch in Trench G in 2003 was fully excavated and removed. Below this were further ditch fills and, as in the ditch terminal, several phases of revetting. The overall depth of the ditch in this trench was over 4m. The furnace uncovered in 2003 on the side of the mound was also further investigated. and general flint knapping debitage were recovered. These artefacts may be associated with several sub-circular features downslope from the cairn as revealed by geophysics. Three areas were investigated by geophysical techniques. Resistance survey was carried out to the NE of the current excavations, extending the survey originally undertaken in 1999. The results show a well-defined zone of high resistance, which coincides with a slight topographic rise. Although the data suggests the presence of stone structures/rubble, no clearly defined structural elements are discernible. Detailed gradiometer and resistance survey were undertaken on Long Howe. The survey aimed to refine the gradiometer data collected during a previous survey (DES 2000, 65-6) by using finer sampling intervals and more sensitive equipment. The survey added some detail to the previous survey, suggesting clearly defined coherent anomalies of likely archaeological origin. Gradiometer survey was also undertaken in the field to the W of St Ninian's Chapel and located numerous anomalies. While some are clearly agricultural in origin, a concentration of pit-type anomalies in the W of the field may be archaeologically significant. There is some evidence in the data to suggest a possible stone structure, although further survey is needed to clarify the nature of this group of anomalies. Sponsors: HS, Orkney Islands Council; Orkney Enterprise; Orkney Archaeological Trust; Orkney College; University of Bradford. provided a date of 100 BC - AD 110. In addition to the burial discovered within the floor deposits of the smithy in 2004, a second burial was discovered just outwith the smithy: an adult male lying on his side in a semi-crouched position in a shallow pit. The ditch section in Trench G was fully excavated to reveal a complete cross-section of the ditch, which was over 4m deep and 8.5m wide. A sequence of ditch infilling and remodelling was uncovered, similar to that found in the ditch terminal (Trench B in 2000). Further geophysical anomalies on the S side of the central mound were also investigated. Overall these proved to be natural, however evidence for the enhancement of the mound was revealed along with a small paved 'alcove'. Several small discrete magnetic anomalies, with similar signatures to the one that represented a furnace revealed in 2003-4, were also investigated. These turned out to be the result of modern ferrous debris. showed that they were natural and, apart from some further lithics, no trace of any in situ Mesolithic activity was recovered. Report to be lodged with Orkney SMR and NMRS. Sponsors: HS A, Orkney Islands Council, Orkney Archaeology Trust, Orkney College, University of Bradford. N Card, J Downes and S Ovenden 2005. Surveys were carried out as the fieldwork component of the Geophysical Survey module for the MA in Archaeological Practice at Orkney College. Three areas were investigated around Mine Howe. Area 1 - Detailed gradiometer and resistance survey were undertaken on Long Howe. The survey aimed to refine the gradiometer data collected during a previous survey (GSB 2000) by using finer sampling intervals and more sensitive equipment and by comparing gradiometer and resistance data. This survey added some detail to the previous survey (GSG 2000) suggesting clearly defined coherent anomalies of likely archaeological origin. Area 2 - Gradiometry was carried out in the field to the west of St Ninian's Chapel, as a continuation of survey undertaken by GSB Prospection Ltd (GSB 2001). In this instance only gradiometry was undertaken and data collected at the standard 1m by 0.25m interval. A variety of anomalies were identified. While some are clearly argricultural in origin, a concentration of pit type anomalies in the west of the field may be archaeologically significant. There is some evidence in the data to suggest a possible stone structure, although further survey is needed to clarify the nature of this group of anomalies. Area 3 - Resistance survey was carried out to the northeast of the current excavations at Mine Howe, extending the survey originally undertaken by GSB Prospection (GSB 1999). This survey shows a well-defined zone of high resistance, which coincides with a slight topographic rise. Although the data suggests the presence of stone structures/rubble no clearly defined structural elements are discernable in the data. Information from S M Ovenden, 18 March 2005. On the last day of excavation in 2005 at the Iron Age ritual and industrial site of Mine Howe, Tankerness, Orkney, the lifting of a small flagstone revealed the top of a human skull. With extra funding provided by Orkney Islands Council and Historic Scotland, over the next few days a complete skeleton was revealed, dating to around 100BC-100AD (dated by associated archaeomagnetic results from within the workshop). It proved to be that of a 25-35 year old male, buried in a shallow grave barely large enough to contain his body. In fact his right toes were bent back and protruded out of the side of the pit and some of his toe bones were found behind his back. The skull was badly crushed by large stone slabs that were used to cover the burial. After excavation the remains were sent for analysis to human bone specialist Vicki Ewens of the Archaeology Department of Bradford University. The recent report from this analysis has revealed that the man was around 5 ft 5 inches tall, probably right-handed and used his upper arm muscles a lot, which, together with the state of his back bones, implied a lifestyle that included heavy lifting and carrying weight on his back. His dental hygiene was also not good and his teeth implied a diet high in carbohydrates, starches and sugars. However it was the cause of death that came as a surprise. This individual had met a violent end with a number of traumatic wounds noted on the bones. On the left shoulder blade was a diamond shape puncture wound. The radiating fractures extending from this wound indicate that it was created by a high velocity blow, perhaps caused by a spear or arrow. Cut marks were clustered on the left side of the body, on his ribs, shoulder, hand and arm. These seem to have been delivered by a sharp, metal weapon, probably a short sword or long dagger, wielded with some force. It was these cuts that probably resulted in the man’s death, as their position of the marks on the bones implied damage to his thorax, left lung and left kidney. From the evidence it seems likely that the final moments in this person’s life were as follows. The concentration of injuries to the man’s left side indicates an attack to the defensive side of his body, suggesting that the victim was armed when the attack happened. It seems likely that the projectile injury was the first wound, inflicted from some distance behind, perhaps to slow him down. The spear or arrow may have pinned the shoulder bone, damaging muscles, but did not penetrate deeply enough to be fatal. But this wound would have been disabling, and as the victim fell or retreated, his attacker, standing beside or slightly behind him, slashed at the victim while he raised his left arm in a final attempt to fend off the blows. The man died almost certainly soon after the attack. A last deathblow may have been inflicted elsewhere on the victim, perhaps on his head, though the skull bones were too damaged to allow detection. The victim was then dumped in a shallow grave. We cannot know whether the man was murdered at Mine Howe, or killed elsewhere and brought to the site, perhaps as a sacrifice or offering to the gods of the underworld. Finding a burial at Mine Howe did not come as a complete surprise. Isolated finds of disarticulated human bone had been found in several contexts, which appeared to conform to the body of evidence for the apparent informal disposal of human remains during the Iron Age. However two formal burials have also been discovered. In 2003 the burial of a human neonate was found in the upper fills of a stone lined pit that had been inserted in the uppermost fills of the ditch surrounding the mound that contains the underground chamber. This burial dates to the late Iron Age c 3rd-5th centuries AD. In 2004 the carefully laid out remains of a young woman were found beneath the floor of the Iron Age workshop. She too had had a hard life and carried out a lot of heavy lifting or work with a bent back and perhaps used her front teeth to clamp something, however she had been buried with grave goods consisting of two toe rings and an antler object on her chest. This latter burial is roughly contemporary with, but in stark contrast, to the unceremonious nature of the male burial, whose grave lay just outside the workshop. Further isotope analysis on these burials is presently being undertaken at Bradford University in order to shed more light on these individuals, in terms of diet, provenance etc. Increasingly, research in both Scotland and Scandinavia is showing a recurrent association not only between metalworking and burials e.g. Knowe of Skea, Westray. but also in close relation to subterranean sites, both natural, as in caves, rock shelters, e.g. High Pasture Cave in Skye, and man made like Mine Howe. The significance of these relationships may be reflected in later mythology. In Celtic mythology Goibniu has powers relating to the creation of implements of life and death, and knowledge of smithing The Norse god Loki is also both blacksmith, and associated with life and death. The transformations relating to both metalworking and the cycle of life and death may be the common denominator - Scottish Archaeological News. The ditch section in Trench G was fully excavated to reveal a complete cross-section of the ditch. Overall the ditch in this trench was over 4m deep and 8.5m wide. A sequence of ditch infilling and remodelling was uncovered, similar to that found in the ditch terminal (Trench B in 2000).Further geophysical anomalies on the S side of the central mound at Mine Howe were also investigated. Overall these proved to be natural, however evidence for the enhancement of the mound was revealed along with a small paved ‘alcove’.Several small discrete magnetic anomalies, with similar signatures to the one that represented a furnace revealed in 2003-4, were also investigated. These anomalies however turned out to be the result of modern ferrous debris. In 2004 as part of the study of the environs of Mine Howe, the Bronze Age barrow on the top of the neighbouring glacial moraine of Long Howe was investigated. Within the cairn makeup several Mesolithic microliths and general flint knapping debitage were recovered. It was thought that these lithics could be associated with several sub circular features down slope from the cairn as revealed by geophysics. Extensive trial trenching over these anomalies showed that they were natural in nature and apart from some further lithics no trace of any in situ Mesolithic activity was recovered.